This privacy statement covers our treatment of information that we gather when you are accessing or using our websites and or services, when you contact us in any matter or when you visit our premises. We gather various types of information including information that identifies you as a person (personal information) as explained in the next paragraphs. Through this statement we want to provide transparency into what kind of personal data we process and for which purpose. We collect and process the following information: company name, job title, given name, surname, gender, e-mail address, business interest and preference fields, function titles, contact history, IP-address, Social ID, Cookie ID and browser/ website usage. https://www.viroclinics.eu. For your convenience we may post links to other websites. We are not responsible for the privacy policies and practices of these linked websites. We do not own or control linked websites. We encourage visitors of linked websites to review their specific cookie policies and privacy statements. 1.2 Why do we collect this information? We need personal data in order to process customer and prospect enquiries and orders. We also need to process personal data to comply with local tax regulations and local and/ or EU law. You are already a customer or prospect of Viroclinics Biosciences. You have clearly expressed an interest in our company. For instance when you contact us by telephone to request brochure materials, information about the academic research we might be involved with, or general information. In order to improve our services, we periodically carry out customer satisfaction research by sending out questionnaires. We will only contact our existing customers for this type of survey. We occasionally ask website visitors for feedback to improve our website user experience. We need relevant personal data to fulfil our contractual agreements with our suppliers. We process the following personal data: first name, sur name, job title, and e-mail and / or telephone number. We retain (personal) supplier data in accordance with the applicable legal period or as long as necessary for the purpose of processing. 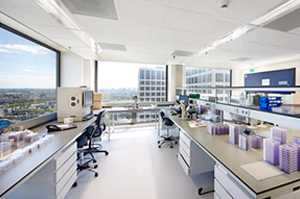 Currently Viroclinics Biosciences operates 2 laboratory sites. For health, safety and security reasons, we ask visitors to leave personal data (company name, first name, and surname in a visitor’s log. We retain personal data in accordance with the applicable legal period or as long as necessary for the purpose of processing. On a regular basis Viroclinics Biosciences publishes job advertisements on our own website (https://www.viroclinics.eu/job-opportunities/) and/ or on external vacancy websites, job boards, etc. During the application process, personal data is gathered through e-mail, personal contact and/ or related documents, such as resumes/ CVs and/ or motivation letters. When applicants submit their CV, motivation letter and/ or any other form of personal data, we will automatically delete all related files within a period of 4 weeks. Alternatively CVs, motivation letters and / or any other form of personal data, will be retained for a maximum of one year, after mutual agreement between the applicant and Viroclinics Biosciences’ HR Department. 1.3 With whom might we share your information? We only share your information with the concerning contact persons, working for Viroclinics Biosciences. We will never share your information with third parties, without your prior approval in writing, except in case we are overruled by law or through local authorities and/ or governmental bodies. CRM (Customer Relationship Management/ Marketing related Software). We use appropriate technical, organizational and quality related security measures to protect any information we hold in our records, from loss, misuse and unauthorized access, disclosure, alteration and/ or destruction. 1.5 How long do we keep hold of your information? We will retain your information no longer than needed. Data retention periods may differ per data type. We retain personal data in accordance with the applicable legal retention period or as long as the purpose of processing. 1.6 How can I access and/ or review the information you hold about me? The right to access your personal data. You will have the right to request (verbally or in writing) your personal data and related supplementary information. The right to rectify inaccurate and/ or incomplete data. The right of erasure / to be forgotten. The right to request restriction or suppression of your personal data. The right to data portability, which allows you to obtain and reuse your personal data across different services. The right to object to the processing of your personal data in certain circumstances. Only in case we have a compelling reason, we may continue using your personal data. Individuals have an absolute right to stop their personal data to be used for direct marketing. In case processing is restricted, we may be permitted to store your personal data, but not use it. We will act upon your request within one month of receipt.